May 22, 2017, 5 a.m.
By Padraic Ryan May 22, 2017, 5 a.m.
Efforts by online activists didn’t stop Emmanuel Macron from winning the French presidential election, but they were further proof that campaigns of misinformation, smears, and targeted leaks are now part and parcel of major democratic events. Pepe the frog may have been pronounced dead on May 8, but the movement that took cartoonist Matt Furie’s creation as its mascot lives on. As the dust settles on an extraordinary presidential campaign, here are some questions Storyful thinks newsrooms need to consider about how they will cover these new communication dynamics. Who is your newsroom’s “4chan correspondent”? Dismissing messaging sites such as 4chan as the preserve of disenchanted teenagers is no longer an option. During the French election, 4chan was where a number of campaigns targeting Macron were planned and coordinated. It was where documents purporting to link him to a Cayman Islands company were first published, and it was where the giant leak of emails from Macron’s campaign was highlighted. How will you deal with Discord, JeuxVideo, and other closed networks? This is a policy question as much as a technical one. The French campaign featured coordinated campaigns launched from private servers on the chat app Discord. Access to these servers was limited to those invited. Newsrooms need to know how platforms such as these work; they also need to know if similar platforms exist for their location. Having identified the platforms, newsrooms need to determine policies for using them. For instance, should pseudonyms be required to access platforms, what are the circumstances in which newsrooms are comfortable going digitally “undercover”? Is your reporting correct but incomplete? To report that on April 29, at 6 p.m. French time, Twitter was bombarded by a number pro-Marine Le Pen memes would be correct; to say it was a planned “raid” announced the day before and coordinated from a Discord server would be more accurate (and a far more interesting story). Similarly, to say people depicted Macron as a Marie Antoinette-like figure isn’t wrong, but it’s more comprehensive to note that it came about following a video and posts from an English right-wing activist who goes by the name of Sargon of Akkad. A recurring feature of misinformation campaigns in the French election was the multiple platforms involved: Plans were hatched on one platform before manifesting on another. YouTube videos were used as tools in closed chat groups; meme banks were shared on 4chan threads and then exploited for Facebook and Twitter posts. This presents a challenge for newsrooms: how best to discover and report on this cross-platform coordination. If, for instance, public posts on Facebook appear to be coordinated, is it telling the full story to only report on the posts and not the coordination? What are your guidelines for reporting on leaks? At the 11th hour of a remarkable campaign, the French election featured one more twist when a massive cache of leaked emails from Macron’s campaign was released. If the timing was unexpected, the leak itself was not a complete surprise. The Daily Beast quoted a Macron campaign official indicating the phishing that gave rise to the hack was anticipated and that the campaign had countered it. Mainstream French media has so far refrained from poring over and reporting on the content of the emails, a notable contrast with U.S. coverage of leaked emails from Hillary Clinton’s campaign manager, John Podesta. For instance, Le Monde stated explicitly that it would not be reporting on the content of the emails before the second round. It’s reasonable to expect similar leaks ahead of elections in the future. Newsrooms should not be considering their policies on reporting these leaks on an ad hoc basis. Instead, clarity on policies and procedures regarding leaks should be drawn up ahead of time. How are you measuring the impact of misinformation? So-called “fake news” outlets are now a fact of life. Whether they are created in Macedonia to resemble U.S. sites, or simply ultra-partisan outlets publishing skewed versions of reality, the liberalization of publishing tools means nobody has a monopoly on narrative. What can be measured, to some extent, is the relative significance of these sites. The reach of social media posts can be measured; website analytics can also be used. If a smear campaign reaches only a tiny audience on an unpopular “fake news” site, its newsworthiness may be less than a viral post. Indeed, reporting on misinformation that had not made an impact until that point may have the effect of giving it that impact. How will you report on misinformation that lives only on social media? Some forms of misinformation, such as the documents purporting to show a link between Macron and a Cayman Islands company, are clearly designed to enter and affect mainstream political discussion. By contrast, the April 29 Twitter “raid” mentioned above was designed simply to “flood” Twitter — the social posts were an end in themselves. Consequently, discovering and reporting upon these information campaigns requires an ability to discover and quantify them as purely social media phenomena. This isn’t a question of counting people present at a protest, or views of a video. These kinds of campaigns bubble away on the social platforms themselves. Are you ready for the next wave of campaigns? After the presidential elections come France’s legislative elections in June. The patriosphere looks set to continue its efforts for these elections. Since the second round of voting, a new Reddit channel has been created for La Taverne des Patriotes, the Discord server where much of the pro-Le Pen, anti-Macron activity was coordinated. On 4chan, anti-Macron sentiment is still very much in evidence (see here and here for just two examples); elsewhere on the site, activists are also looking ahead to the forthcoming German elections. News organizations, too, should be looking ahead to upcoming events and putting practical plans in place as to how they plan to discover and report upon the likely campaigns of misinformation. Journalists should take the time to understand the various groups in play and learn about their tools and tactics. This new report from Data & Society on media manipulation and disinformation is a good resource to get started. There are a number of reasons why misinformation campaigns may have failed to have as great an impact in France as in the 2016 US presidential election. A study by academics at Oxford University suggested French people tended to share more reliable information than their U.S. counterparts. The lack of an equivalent to Fox News has been cited by the managing editor of Libération in a New York Times article as a factor in the limited spread of misinformation. As noted previously by Storyful, French media engaged in a number of initiatives to attempt to quash and debunk falsehoods, with France 24’s Observers unit, and the collaborative CrossCheck France campaign (to which Storyful contributed), both highlighting and debunking falsehoods as they arose. Elsewhere, Le Monde’s Decodex browser extension and Liberation’s CheckNews.fr, the latter made in partnership with advertising agency J. Walter Thompson Paris, were concerted efforts to combat misinformation and false reporting. Social media platforms, too, played a role: During the campaign, Facebook announced the removal of 30,000 fake accounts in France. The example of France shows it is possible to curtail these campaigns. But to do so, newsrooms need to move the discussion out of the realm of the theoretical and into the practical. At Storyful, we have formed a dedicated team, comprising journalists and product developers, to systematize how we monitor and tackle the spread of misinformation from closed networks to public platforms. These methods must now be accepted as a part of democratic discourse in Western societies, and, that being the case, it is incumbent on newsrooms to act. So ask yourself — who is your newsroom’s 4chan correspondent? Padraic Ryan is a senior news journalist and news projects coordinator at Storyful, a social news and intelligence service that helps publishers discover and use eyewitness video and research from the social web. This story was published with the help of the News Integrity Initiative. 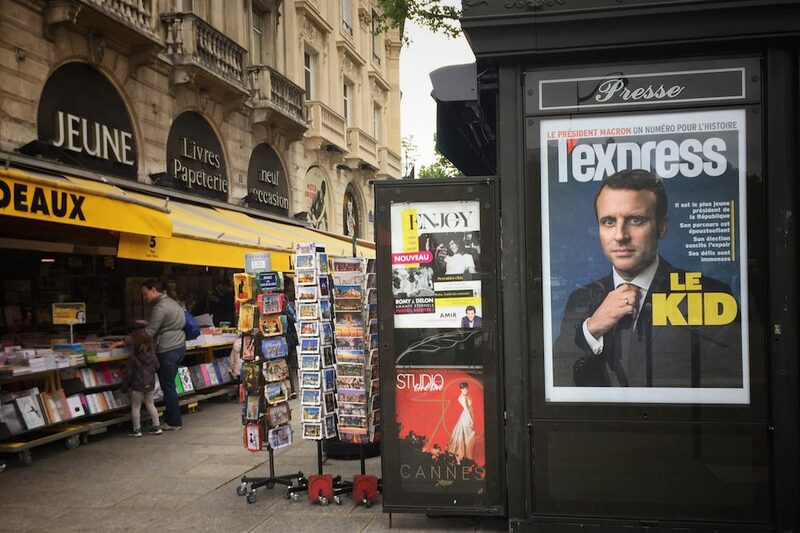 Photo of a Paris newsstand on May 8 by Lorie Shaull used under a Creative Commons license. POSTED May 22, 2017, 5 a.m.
Ryan, Padraic. "“Who’s your 4chan correspondent?” (and other questions Storyful thinks newsrooms should be asking after the French election)." Nieman Journalism Lab. Nieman Foundation for Journalism at Harvard, 22 May. 2017. Web. 23 Apr. 2019. Ryan, Padraic. "“Who’s your 4chan correspondent?” (and other questions Storyful thinks newsrooms should be asking after the French election)." Nieman Journalism Lab. Last modified May 22, 2017. Accessed April 23, 2019. https://www.niemanlab.org/2017/05/whos-your-4chan-correspondent-and-other-questions-storyful-thinks-newsrooms-should-be-asking-after-the-french-election/.